The new Institut Supérieur de l’Aéronautique et de l’Espace (ISAE) groups together SUPAERO and ENSICA to form the leading aeronautics and space technology teaching and research hub in Europe. 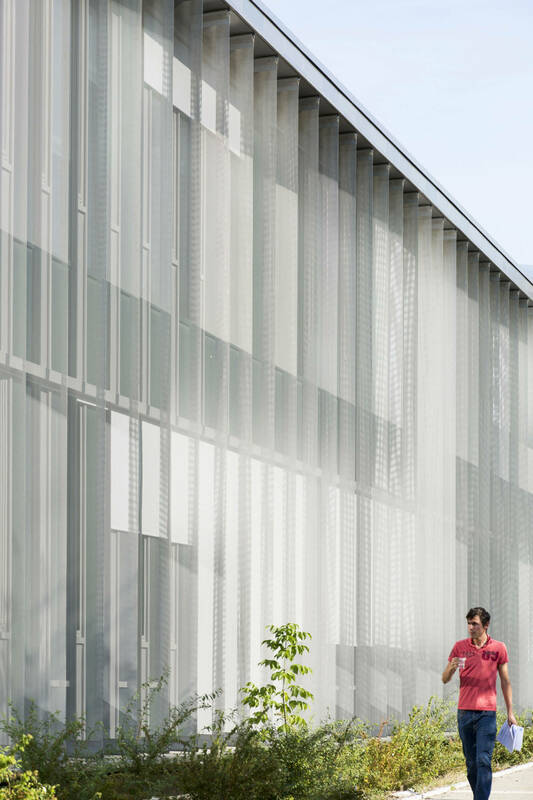 On a green campus on the banks of the Canal du Midi, the project comprises a renovated existing building and a new building. Connecting and unifying the old and new buildings, a shared “skin” gives the facility a new face that expresses a sense of both quality and energy. Its flexible 1.35 metre grid allows a variety of interior partitioning options. The vertical stretched canvas sunshades contrast with the horizontal acroterions and undercroft, which is raised above ground level. Unique features enliven this regular grid: the lecture theatre, like an aluminium pod, breaks up the vertical alignment and underlines the forum. The main entrance with its concourse passes under a large, transparent ETFE porch opening onto the forum and the planted patio in the background. Bringing light and views into the heart of the teaching areas, the patios and interior gardens, with their natural wood curtain walls, each with its own identity, are both places to relax and reference points.